If everyone in the US used just one less gallon of water per shower every day, we could save some 85 billion gallons of water per year. A five minute shower can use 10-25 gallons of water. Take short showers and save water. For more than 35 years the American Water Works Association has celebrated Drinking Water Week with its members. 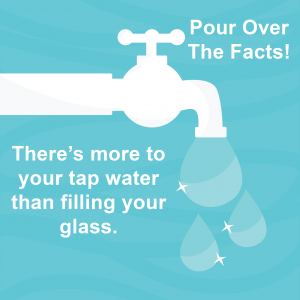 In 1988, AWWA brought the event to the attention of our government and subsequently a resolution to name the first week of May as Drinking Water Week, and an information kit was distributed to the media and to more than 10,000 utilities. The following year, AWWA approached several organizations to participate. Through these efforts, the National Drinking Water Alliance was formed of 15 nonprofit educational, professional, and public interest organizations. The Alliance dedicated itself to public awareness and involvement in public and private drinking water issues, and continued its work to organize a major annual educational campaign built around Drinking Water Week.